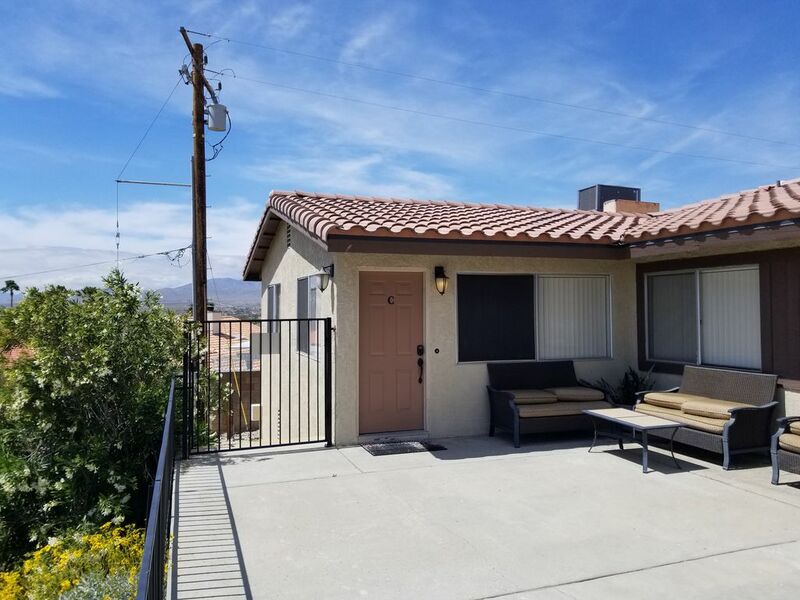 Unit C in a 3 unit building, located in the Miracle Hill area of Desert Hot Springs, in the Spa Zone, with panoramic views, minutes from the fabulous Palm Springs and 2 blocks from the famous Cabot's Museum, 40-45 minutes from Joshua Tree National Park. Attached 2 bedroom condo unit with 1 king size bed in a master bedroom suite, 1 queen size bed in the second bedroom, 1 queen size sofa bed in living room, living room, dining area, kitchen, 2 full baths, basic kitchen utensils, toaster, microwave, stove, coffee maker, towels, paper towels, basic bath accessories, bed linens, hair dryer, common laundry room with washing machine, cloth dryer, iron and ironing board. Shared common patio areas. TV with local channels only. Free Netflix. No cable. Please note this condominium does not have a pool or spa, however there are day spas nearby. Great for guests who enjoy the sunshine, Palm Springs, Joshua Tree National Park, desert heat or winter air, Coachella, Stagecoach and other music festivals. Please note: Frequent strong wind events do occur in this area due to higher altitude. Open desert areas around, please be mindful of desert plants and animals when exploring the areas. Desert Hot Springs is a cannabis friendly city, however no smoking is allowed on my property. No smoking. No loud music or party. Drug free house. No sublet allowed. No pets allowed. Please park in garage #C or in front of it on the driveway. Guests agree to sign the short term rental agreement. A copy of the rental agreement is attached to this listing under "rules and policies". PLEASE NOTE: There is no mail or parcel delivery from USPS to this property. If it is an Amazon delivery, you need to make an arrangement to be present to accept the package. Owner is not responsible for any misplaced or lost package. Both shower heads at regular height, standard 8 foot ceiling. local channels only. Free Netflix. No cable. steps down from front gate to unit. We enjoyed our stay at this two bedroom condo very much! The self check in instruction was very clear and it was easy to find, even at night! It's minutes from Palm Springs and less than an hour from Joshua Tree NP. Living room is spacious and it has a full kitchen. Thank you so such a lovely condo. Lovely excellent condo. Clean and oh so nice. Very nice. Owner attentive. Thank u. Great Value! Great View! Great experience! I will defiantly stay again. Clean and Modern. The outside patio is quite large and we enjoyed sitting outside - star gazing was especially nice. Access to the laundry room was also very nice. We (6 adults and a 2-year-old) were visiting family in the area and this was the perfect place for us to sleep, eat and chat. Thanks Kenny. Property was very clean and organized. Kenneth was nice and welcoming. Miracle Hill area of Desert Hot Springs, in the Spa Zone, 2 blocks from the famous Cabot's Pueblo Museum, minutes from Palm Springs, 40 to 45 minutes to Joshua Tree National Park, 30-35 minutes to Cabazon Outlet Center, desert music festivals, Coachella and Stagecoach.